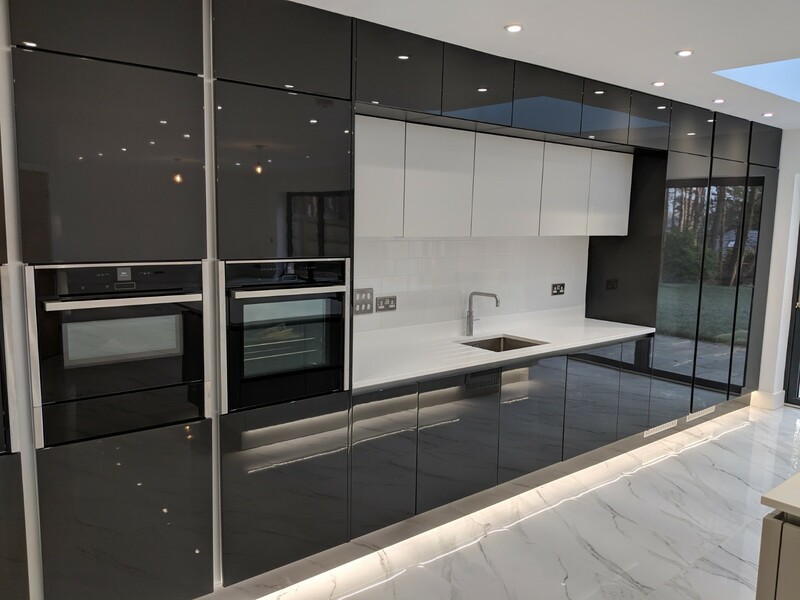 Stunning for its symmetry and monochrome colour scheme, this kitchen was designed by Wimborne based Meridien Interiors for a private client in Ashley Heath, Ringwood, Hampshire. Featuring the popular Porter handleless kitchen from Second Nature, this kitchen was designed to create a minimalist interior look, whilst offering all the practicalities required of a working kitchen. The kitchen primarily features two key working areas, a large island with a Neff 90cm flex induction hob and downdraft extraction together with a bank of six floor to ceiling tall units that include two Neff hide and slide ovens, a Neff combi oven and microwave with warming drawer on one side and a Neff larder fridge, full height frost free freezer and food storage larder on the other side. Between the two groups of full height units is a recessed area for the sink and integrated dishwasher. The tall units include top cupboards which create a frame along the full length of the bank of units for aesthetic appeal and additional practical storage, while above the sink area are wall units which are recessed slightly from the top units emphasising the ‘alcove’ appearance. With this project, Meridien Interiors provided a full design, supply and installation service. Kitchens can be purchased on a supply only basis or a supply and fit basis, depending on each client’s individual requirements. To maximise visual impact, matt dove grey was chosen for the colour of the island units and the wall units above the sink while the tall units and the top cupboards are finished in graphite gloss. The dramatic contrast between the colours and the gloss and matt finishes creates a very impactful kitchen scheme that complements the pure white quartz worksurface and splashback and the grey marbled high gloss floor tiles perfectly. The island, which includes a breakfast bar overhang to allow for seating up to six people, includes six base units on the living room side, and a run of pan drawers with integrated cutlery drawers together with a wine chiller on the hob side. 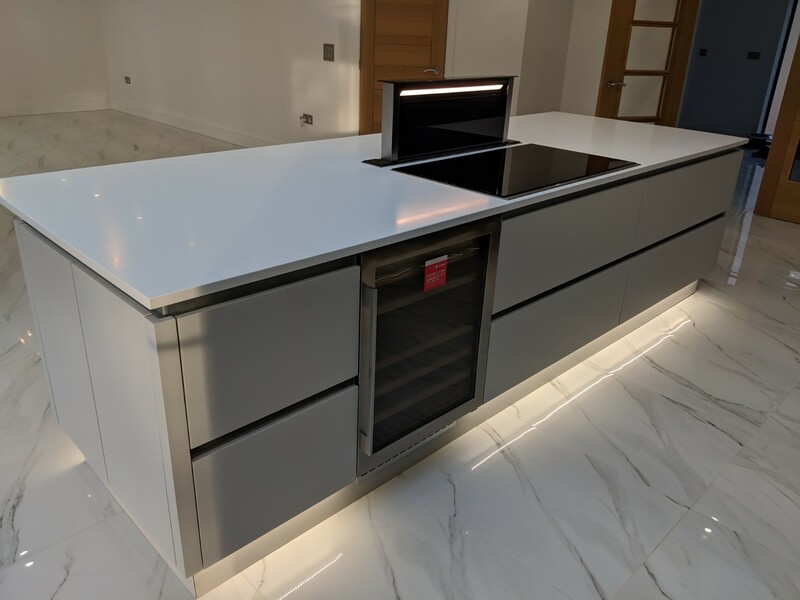 LED plinth lighting not only accentuates the stunning floor, it emphasises the linear look of the kitchen and offers low cost, soft ambient lighting that’s especially effective in the evenings. With this project, Meridien Interiors provided a full design, supply and installation service. Kitchens can be purchased on a supply only basis or a supply and fit basis, depending on a client’s individual requirements. Meridien Interiors works closely with architects, developers and private clients to provide luxury showhome quality kitchens at affordable prices. For further information about Meridien Interiors’ kitchens and bedrooms, please visit www.meridien-interiors.co.uk or call 01202 216688. Or come and speak to one of our kitchen designers and view our display kitchens in our showroom at Unit 62, Azura Close, Woolsbridge Industrial Estate, Three Legged Cross, Wimborne, Dorset BH21 6SZ.